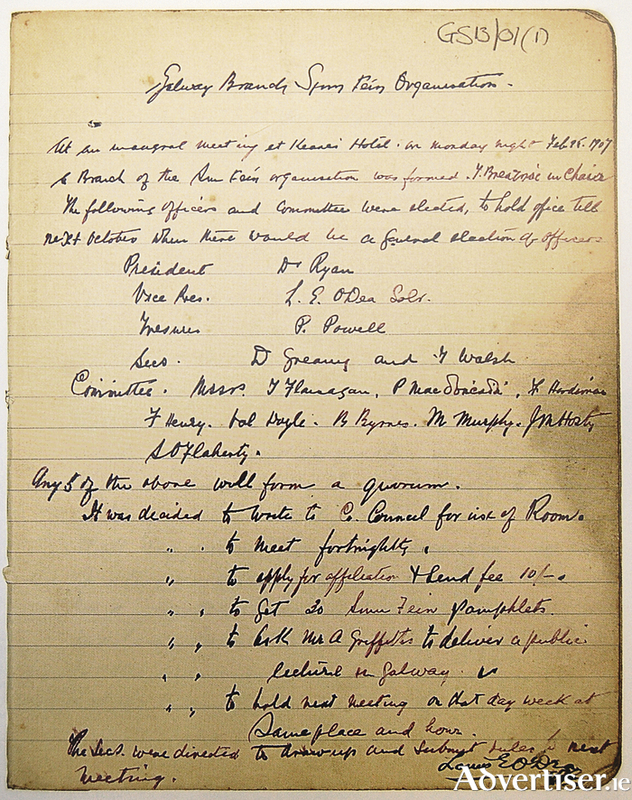 Our illustration today is of the minutes of the inaugural meeting of the Galway city branch of Sinn Féin which was held in Keane’s Hotel, Eyre Square, on February 15, 1907. T Breathnach was in the chair. “The following officers and committee were elected to hold office until next October when there would be a general election of officers. “President, Dr Ryan; Vice-president, Louis O’Dea, solicitor; Treasurer, P Powell; Secretaries, D Greany and T Walsh. “Committee: Messrs T Flanagan, P Mac Donnchadha, F Hardiman, F Heary, Val Doyle, B Byrnes, M Murphy, John Hosty, S O’Flaherty. “Any 5 of the above will form a quorum. “It was decided to write to the Co Council for the use of rooms; to meet fortnightly; to apply for affiliation and send fee of 10/-; to get 30 Sinn Féin pamphlets; to book Mr A Griffiths to deliver a public lecture in Galway; to hold next meeting on that day week at same place and hour. The secretaries were directed to draw up and submit rules to the next meeting. The illustration is shown courtesy of Galway County Council archives. Louis O’Dea was a local solicitor and coroner. T Breathnach was Tom Walsh, a professor of pathology in UCG who was largely responsible for “Converting UCG into a hot-bed of Sinn Féinism”. John Hosty was a Shantalla man who was sent by the Volunteers on Easter Saturday 1916 to check if there was to be a Rising or not. This simple but important document is just one of the hundreds of illustrations in a new publication titled Atlas of the Irish Revolution edited by John Crowley, Donal Ó Drisceoil, and Mike Murphy and published by Cork University Press. It is the most important and comprehensive publication ever produced on the period 1912 – 1923. In addition to the illustrations, many of which are reproductions of rarely seen documents, it includes more than 300 original maps and more than 140 contributions from leading scholars across a range of disciplines. The atlas is accessible, readable, and brilliantly produced, it has wide appeal to a specialist and to popular readership. Few readers will finish this book without fresh understanding of the forces that shaped modern Ireland. From a Galway point of view, there are some fascinating maps, photographs, and contributions included. It is a big volume of almost 1,000 pages. It is the reference book. In good bookshops, very highly recommended. On Saturday September 30 at 2.30pm, art historian Anne Cormican will discuss Irish artist William Orpen (1878-1931 ) and his wartime paintings at Galway City Museum. In 1917, William Orpen was appointed an official war artist and was sent to the Western Front with a strict brief from the War Office as to who and what he was to paint. The intention behind the commissioning of war artists was to provide eyewitness images of the war to illustrate publications. One of Orpen’s works, depicting Lieutenant-Colonel of the Irish Guards, George Henry Morris (1872-1914 ) from An Spidéal, is currently on display in the museum in its Galway and the Great War exhibition. Anne Cormican works at the Dublin City and Hugh Lane galleries and teaches at the School of Art History and Cultural Policy, UCD, where she is completing a PhD on Orpen. Her research on Orpen’s work as an official British War Artist, and drawn upon in this lecture, was carried out at the Imperial War Museum London and was generously funded by a scholarship awarded by the Thomas Dammann Trust. For further details or to make a booking contact the museum on (091 ) 532460 or email [email protected].